Home > Television > Which TVs Will Work on Digital Tv? If you've read the other articles about the digital switchover in this section then you will know that it's about to roll-out throughout the UK and you'll know that there are various ways of receiving it, through an aerial, satellite, cable or broadband. But once you've got the digital signal into the house, will your television and other equipment work? The good news for householders in the UK is that almost any television will work with digital transmission. The bad news is that if it's not relatively new, you'll have to buy a digital tuner (also known as a digital receiver) or get a new TV service (for satellite, cable or broadband) to make them work. If you've bought a television in the last few years it's highly likely that it will have a freeview receiver built into it. This means that as long as your rooftop aerial is good enough you can receive digital transmissions through it, plug the lead straight into your television and you're away. If your television is too old to have a freeview tuner in it then you will have to buy a separate tuner or receiver. These are often known as a 'set-top boxes', even though it's now possible to buy ones that are only a bit bigger than an ordinary SCART plug. There are all sorts of tuners available, some with the facility to record to hard disk built in, but make sure that you have the right connection for the tuner that you buy. Most televisions have one or two SCART sockets but older TV's will only have an RF adapter, the round socket that an ordinary aerial lead goes into. Cheaper set-top boxes may not have an RF adapter but you must get one that does if you have no SCART sockets on your TV. It's also worth pointing out that if you have a video recorder then you will probably need to buy a receiver for that as well (unless it has one built-in). Of course you'll also need a tuner for every television in the house, so the cost may well mount up. Although we covered this in a separate article it's worth repeating here that you will almost certainly need a 'high gain' aerial, digital television is unlikely to work with an old aerial. If you go for satellite then again the same principle applies, almost any television will work with the satellite receiver but you will need one for each television or video recorder in the house. If you buy a complete TV satellite package then you will get all this provided for you. 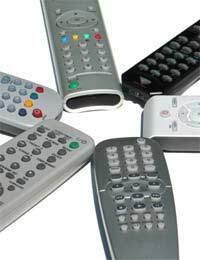 If you decide to put up your own satellite and buy a receiver then you will need to make sure you cater for all the devices you are going to use. Many satellite packages come with a device known as a personal video recorder (PVR) or hard disk recorder. These can record programs for you without a tape and you'll only need your video recorder for playing back videos. In that case there's no need to get a second receiver for the video recorder. With cable and broadband television packages (that's television over broadband to your TV, as opposed to watching television programmes on your PC over the internet) then the receiver box will be provided in the package. There is effectively only one company (apart from a few small local companies) selling each service at the moment so you are stuck with the equipment that they provide you with. The will have different options for providing a digital service to more than one television. Don't forget that if you have a TV and a video recorder or DVD player in a room somewhere but you only use them to watch videos or DVDs then you won’t need to convert these at all. They will carry on working with each other and there'll only be a problem if you want to watch ordinary TV programmes as well.